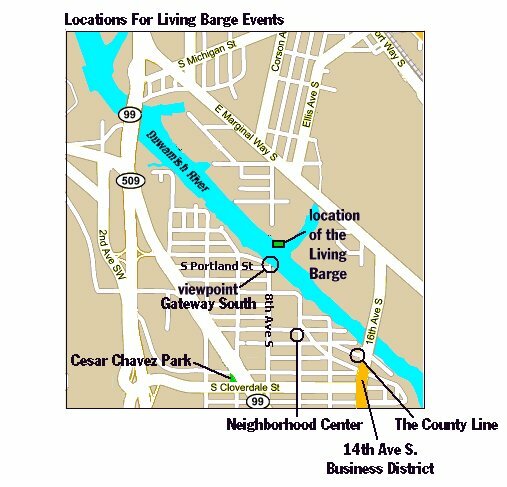 Location of the Living Barge: Gateway Park North, at the end of 8th Ave. S. on the Georgetown side of the Duwamish (there is no actual access onto the barge). The South Park Neighborhood Center, location for the tile-making workshop, is at 8201 10th Ave. S. at Southern St. The County Line, South Park's favorite dive bar, is located at 8456 Dallas Ave. S., just south of the South Park (16th Ave S) Bridge at the intersection of Dallas, Sullivan and 14th Ave. S.
The 14th Avenue South Business District, South Park's Main Street is also just south of the South Park Bridge. Cesar Chavez Park, where the plants from the Living Barge will be replanted, is just west of SR 99 on Cloverdale St.
From SR 99 S, take the "South Park" exit and turn LEFT at the end of the exit ramp. At the next stop sign make another left onto Cloverdale - come over the hill & Cesar Chavez will be on the left hand side of the street just before the 99 overpass, at 7th Ave. S.
From E. Marginal Way, cross over the South Park Bridge (take a RIGHT at 16th Ave S.) and then take a RIGHT on Cloverdale (the first light after you cross the bridge). Cesar Chavez Park will be on your right just after you go under the SR 99 overpass.